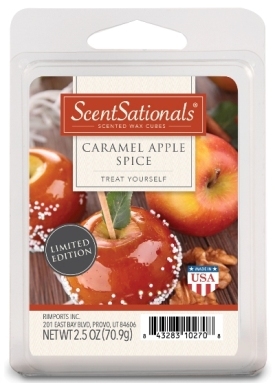 I’ve always been a huge fan of ScentSationals wax melts so when I spied Caramel Apple Spice at my local Walmart, I nabbed a few to review. First sniff, the wax smelled like a classic caramel apple but more candied like. Like red candied apples. I didn’t smell much spice but that’s okay… hoping that spiciness comes to life once the wax is melting. Caramel Apple Spice fragrance brings notes of sweet vanilla infused caramel, swirled with juicy ripe apples, a dash of cinnamon spice and deliciously accented by sugared sprinkles. Simply mouthwatering, you won’t want to share! Mmm! That sounds perfect!! I smelled everything in the description minus the spice. Let’s see what notes come out once melting! Because my great room is so huge with vaulted ceilings, I used the entire clamshell pack in two electric melters (3 cubes each) and waited for the Caramel Apple Spice magic to begin. It took minutes before the aroma was moving through my great room and soon after that, the fragrance was everywhere, filling every nook and cranny of my home. This scent was strong and smelled so good. Throughout the room, it smelled like a red candied apple – no spice. With my nose up to the melter, I could smell the sweet caramel loud and clear and I found that interesting. Regardless, far away or up close, this fragrance smelled sweet and delicious. Fresh apples, candied/caramel notes with lots and lots of sugar. Still no spice, not to my nose anyway. Strength for Caramel Apple Spice – I would rate this scent a 10 out of 10 in any size room. Loved the strength!! This was a yummy scent and one I would for sure purchase again. Next time you’re at Walmart, smell it for yourself. 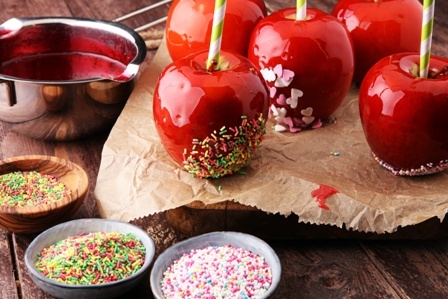 If you love sweet candied apple scents… Caramel Apple Spice is a must have. I recently discovered the Scentsationals Tarts from Walmart, and I love them…..Most of them that I have tried have been wonderful, and I have a small home, so for me usually two cubes lit in my kitchen smells wonderful and goes through my whole downstairs level. I would think in a large home, you might need 3 cubes, but even still the scent is fabulous, and the cost is so reasonable as well…..Sometimes they are so potent, after about an hour, I can unplug and the scent lingers for hours…..I love that. I feel that I am definitely getting my money’s worth.